A valley is an elongated depression in the landscape that is formed by the action of water (V-shaped) or carved out by glaciers (U-shaped). Valley bottoms are represented by "U" or "V" shaped contour lines with their closed end pointing towards higher elevation. Bottom left picture shows the contour lines overlaid on the 3D image and the right picture is the topographic map (1:50000) of the same valley. Top of the images and map is toward south direction. A gentle wide valley bottom with higher elevation toward south (contour lines point toward south) is evident. Therefore the river flow is from south to north with tributaries flowing down the draws (gullies) on either side of the valley. Two ridge lines run north-south connecting peaks on either side of the valley. Steep gullies and spurs run from ridge lines to valley bottom. 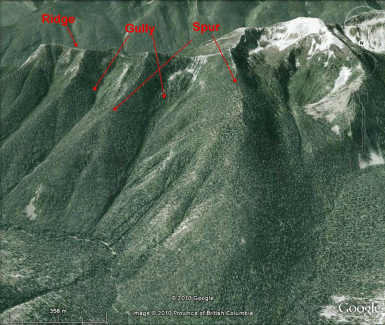 Gully is a channel or ditch formed by water erosion. Couloir is a steep gorge or gully formed on the mountain side. 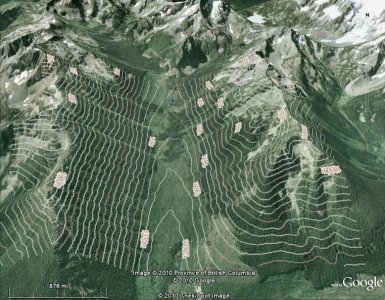 Gullies are represented by "U" or "V" shaped contour lines with their closed end pointing towards higher elevation. U-shaped contours represent more rounded gullies, while V-shaped contours are used for narrower gullies. 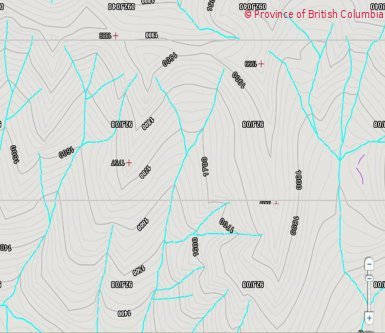 You can easily determine the direction of flow of streams in gullies and draws in a topo map by noting the direction to which the contour lines point; naturally the stream flow is from higher elevation towards lower elevation. The above landforms' names are sometimes used interchangeably in backcountry recreation. A ridge is a landform feature characterized by a continuous elevational crest with sloping sides. Arête is a narrow ridge formed by glacial erosion. 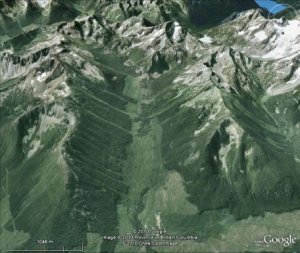 A spur is a lateral ridge projecting from the mountain or the main ridge crest. A spur is usually formed by the two roughly parallel streams eroding gullies (draws) down the face of the mountain from the ridge line. (check out interlocking spurs and truncated spurs for more information). Ridges are represented by "U" or "V" shaped contour lines with their closed end pointing towards lower elevation. U-shaped contours indicate broader ridges, while V-shaped contours represent narrower and sharper ridge lines. Aretes and spurs are often generally referred to as ridges in backcountry recreation. 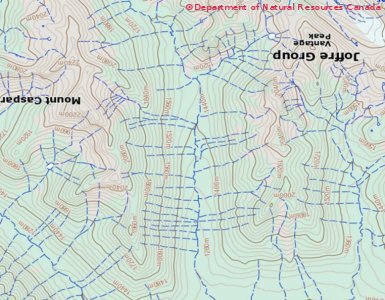 Ridges, gullies, and stream channels are represented clearly by contour lines in the following image and topographic map (1:20000). Keep in mind that terrain features may not be easily detected or their shape may not be as pronounced depending on their size or depth and the scale of the topo map. For example in a 1:50000 topo map (see top topo sides of valley), contours representing gullies and ridges will be more rounded and show less detail (in general) compared to the contours (Us and Vs) seen in a 1:20000 topo. Small stream channels or spurs may not show up as pronounced Us or Vs even in large scale topos. Same problem applies to other terrain features. The smaller scale the topo map is, there will be less detail with more generalization, and the harder it will be to detect terrain features. Therefore a map at a scale of 1:250000 while adequate for bike touring and car camping will not be useful for hiking or mountaineering trip planning. 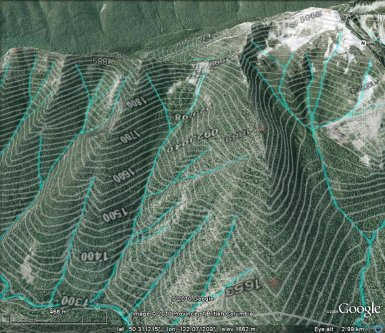 Using Geokov Map Maker, create a shaded relief map (hill shading), as shown in Map Maker Help and Examples, in order to better practice topo map reading and terrain identification. Couloir and arete examples: videos show skiing / riding a nice looking couloir! and hiking on Carn Mor Dearg (CMD) Arete extending to Ben Nevis mountain.